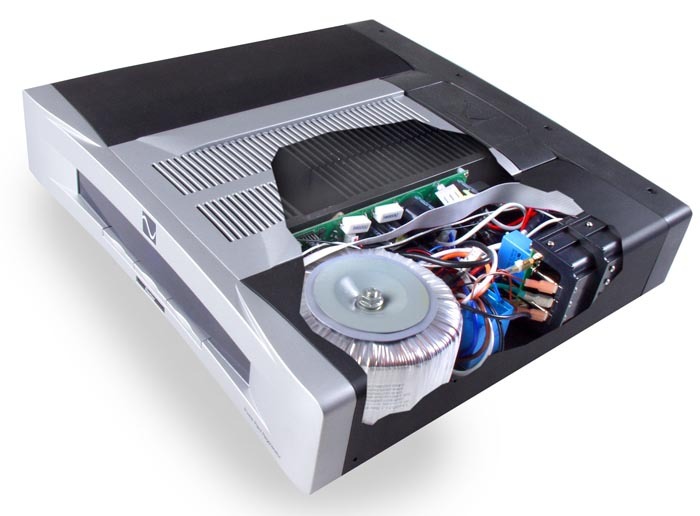 In August 2005 many moons back, we published here on the site a review of the PS Audio P1000 Powerplant. That review was very favorable to the big power regenerator which also generated plenty of heat. Listening with the juice being regenerated and coming out in balanced form was sonically very attractive. However, the P1000 came at a price. The price you paid was financial for one though listening with the beast in line soon made you forget all your financial pain. What was a constant drain however when living with the P1000 was its substantial radiation of heat. Using a P1000 became akin to using a space heater - and a good one at that. To call that particular PS Audio design terribly efficient would have been a wag-the-dog spin job. 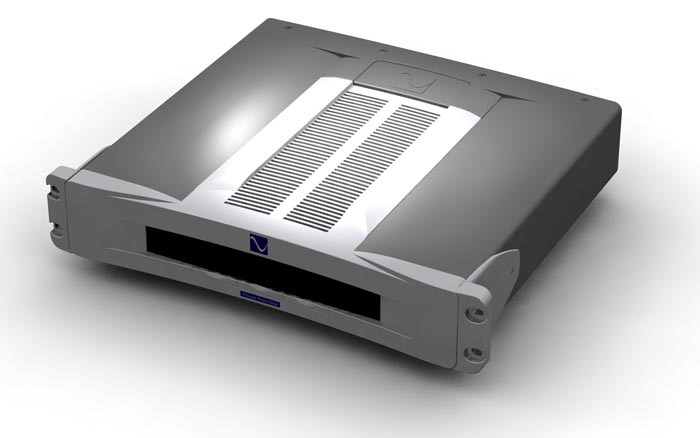 Now PS Audio has introduced a completely overhauled design for its signature power regeneration. In fact, it is a different thing altogether. Its principle of operation has changed, its looks, its capabilities - in short, it's all new and presumably, mo betta functionality wise. Sonically, we refer you back to our previous review for more details than we'll provide today. To boot, the Power Plant Premier or PPP as the new concept has been christened delivers an ample 1500 watts of regenerated AC power. That's 50% more than its predecessor. 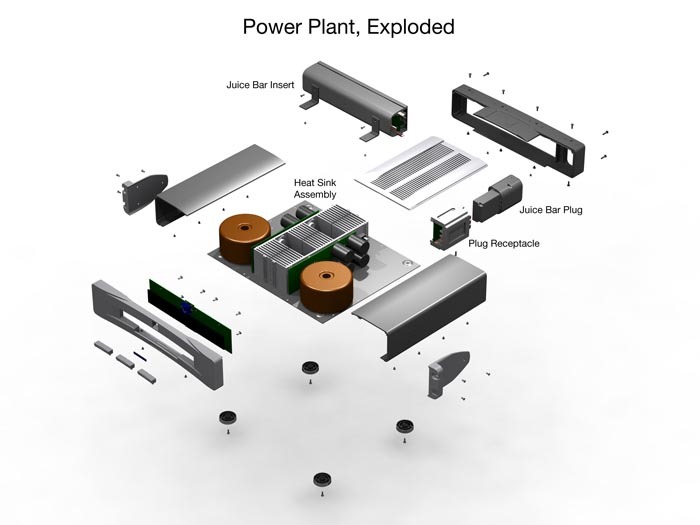 Next, it puts out that amount of cleaned-up and regulated power with 85% thermal efficiency. The thing drives cool and is gentle to the environment too. Al Gore should be proud of the guys from Denver. Next, the PPP sports five so-called IsoZones. Each IsoZone is a color-coded AC duplex fixed to the back of the PPP. IsoZones prevent contamination between duplexes. Three power zones each comprise either two or one IsoZone. Each of these power zones can be set to be always on, switched on or delayed on. A clever way of booting your complete system in sequence has thus been made available. Other features of the zones will be discussed in a moment. For our review, we received the US version with ten US outlets above. Other features of the PPP are a THD analyzer with a front panel readout just like the built-in voltage meter. Most of the wave-form options from the previous Power Plants have been omitted. Your choice is now simply between MultiWave or Sine Wave. CleanWave is a magnetic sweep. A request originating with probably all of the P1000 users has now been met by including a remote control! According to PS Audio, the chassis design was inspired by a BMW car. Whether you recognize this tie-in or not, it does sport a divided grill milled from solid aluminum which is also used for the fascia. When integrated in an audio system, the look is unobtrusive. Like all other PS Audio equipment of late, there's extensive use of blue lights. The logo is backlit in blue and this color is also used for the informative display. Via the remote control, these lights can be either dimmed or turned off. The former series of power plants were conventional class A/B stereo amplifiers putting out one note. A strong note, mind you, but only 50 or 60Hz depending on locality and 115 volts or 60 volts per channel in balanced configuration. 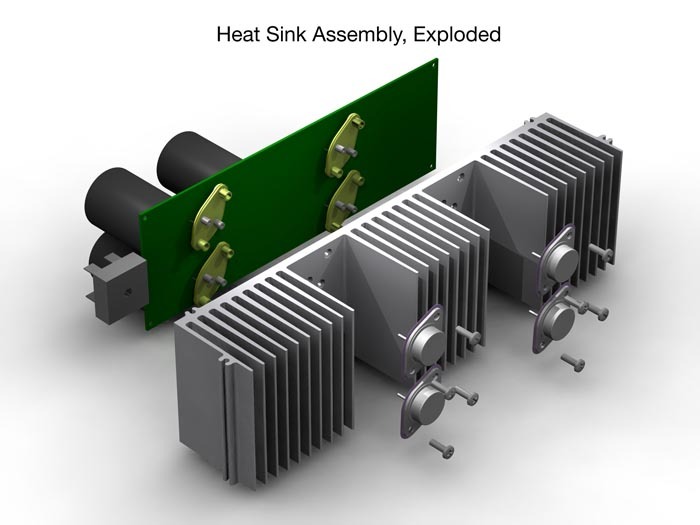 The DC power supply needed for these regenerators produced significant heat. One presently hot technology that runs really cool is Class D of course. With its switching technology, a lot of power can be generated very efficiently. The downsides are the high noise levels inherent to extremely fast switching. For audio use, filters are needed to prevent a Class D amplifier from acting as a powerful radio station transmitting nothing but noise. The project brief of a power plant is to provide clean power of course and not some troubled version thereof so Class D proved not an option for these purposes. Enter Bob Stadtherr, PS Audio's out-of-the-box thinker. He invented a way of converting the incoming AC signal into a 5-volt square wave by using a synchronization circuit. This square wave is perfectly in phase with the AC signal so it follows it accurately. Now a processor, a DSP chip running at 6.4kHz using Direct Digital Synthesis techniques, assembles a sine wave from the self-generated square wave. Next, the sine wave is fed to a digital-to-analog converter or DAC, the same kind as one would find in a CDP. The DAC here samples the sine wave and puts out an analog 2.5-volt signal again phase-locked with the incoming AC signal. Now we have a completely regenerated but downscaled likeness of the incoming signal which merely requires an amplifier to boost it to the necessary voltage. Of course there is also a filter that cleans the low voltage analog signal before it is sent off to the power amplifier. Filtering of low voltages is far easier to achieve than on high voltages. As mentioned, the PPP uses 2.5 volts for the analog signal and from this signal, all remnants of DC coming from the DAC plus any remaining sampling noise of the DDS circuit are purged. The basic idea hence is to create an exact miniature replica of the incoming AC signal, clean it up, amplify it to the desired and now precisely stabilized level to pass it on to whatever device wants it. And because it can be done without bulky transformers -- the load is driven directly -- the source impedance can be very low. Still, this technology is not yet the precise reason why the PPP is so much more efficient than its predecessor (which, incidentally, used the same minimize/filter/amplify technology). The real secret behind the efficiency resides in the power supply for the amplifier. 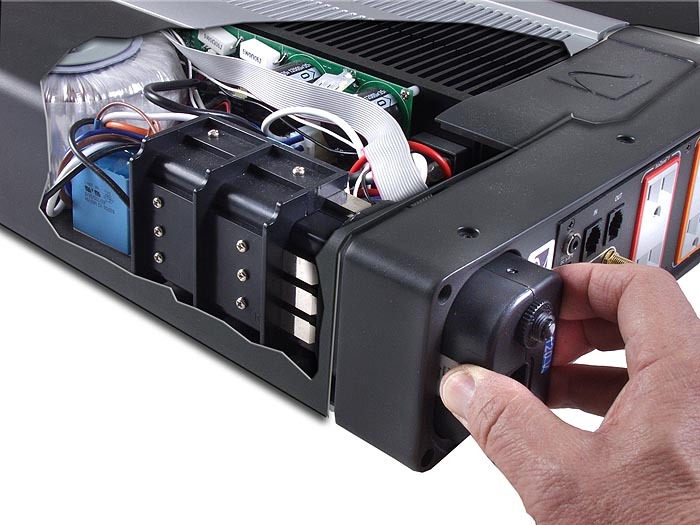 In the P1000, PS Audio used a 200-volts DC power supply. This voltage was fed to a class A/B amplifier and the result was a 50 or 60Hz output. With the 200 volts, the amplifier would waste 50% of the used energy on a good day, more on a bad one. In the PPP, only 70 volts are used to feed the amplifier. That naturally lowers both heat and output voltage substantially. In order to elevate the output voltage, the PPP design now couples the 70-volt DC power supply and amplifier and AC-couples them hot to ride up and down with the incoming sine wave. That's a really bright idea. The resultant output is more than sufficient to produce a powerful and clean sine wave without the need for a high power supply voltage. From this general description, we understand that a PPP either delivers 120 volts at 60Hz or 230 volts at 50Hz. These figures are fixed unlike the previous power plants where a certain amount of deliberate over or under voltage could be dialed in. However, the design platform is open to such and other adjustments in the future. We received the US version of the PPP together with a variety of US-based PS Audio power cables. What was clear from the start was that the EU and UK versions of the PPP lack 50% of the outlets. 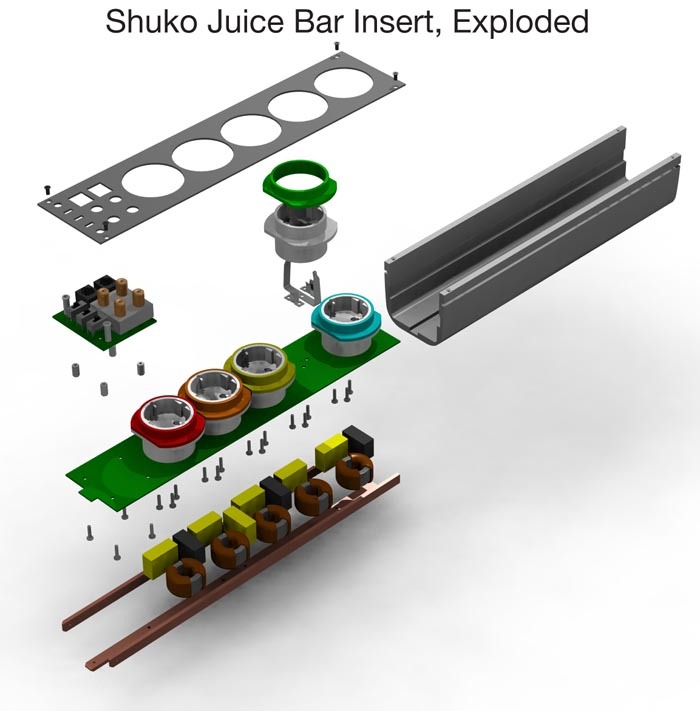 The PPP is compactly built and as far as we know, the only advantage to US power connectors is their small foot print. EU Schuko and UK connectors are far bulkier but only the EU grounded connectors can be phase-inverted. All other connectors sport a fixed ground pin. Equipped with a load of cables and the PPP, we started to swap out our Crystal Cable power cords for PS Audio equivalents. Going from the ultra-thin Dutch Reference designs to the thick, unwieldy American cables was a real struggle. Imagine fighting an adolescent boa constrictor. In the end human stubbornness prevailed and all equipment was strategically fed from five IsoZones. 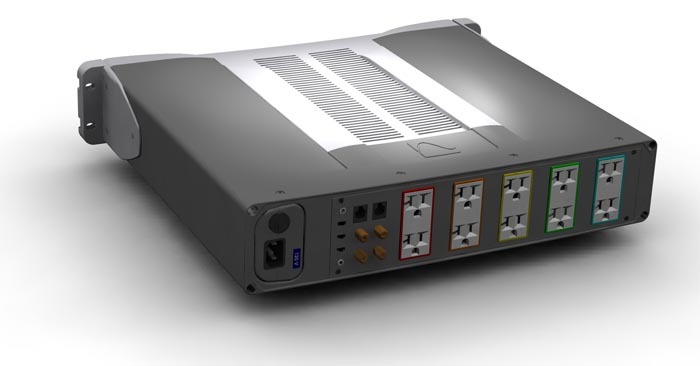 Each IsoZone can be set to remain powered up continuously -- that's what we picked for our DAC -- or switched on when the PPP is powered up. Mind you, a continuously live IsoZone is not directly connected to the grid when the PPP is switched off. It still receives regenerated power according to Paul McGowan who corrected our initial assumption that the PPP in this mode acts merely as a surge protector and passive filter using so-called nano crystalline filtering. The PPP thus never really shuts off although the front panel would suggest it. 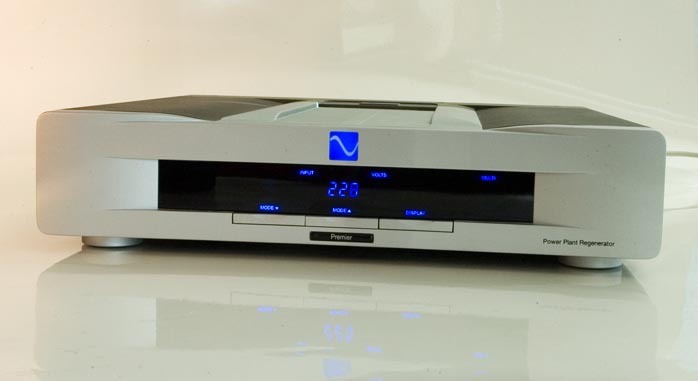 Our CD player was connected to the Switch On zone and the integrated amplifier was on Delayed On in order to have it fire up last. For the Avantgarde Duo subs we used another Always On IsoZone. Here again the US version proved king with its 10 outlets separated into 5 IsoZones. Europeans have to be creative if five outlets turn out to be insufficient. A good solution is to cascade an additional PS Audio Quintet power center, an extra investment of course which nonetheless generates additional IsoZones and Power Zones. In fact, the outlets of the PPP are a complete Quintet, proof of the smart modular building approach they practice in Colorado. Fresh out of the box, the PPP needed some power time. We used that for casual listening while performing chores or working. After a few days, it was time for serious listening sessions. From the previously reviewed P1000, we knew what to listen for - ease, blackness, detail and emotion. Where before we had been fond to play around with all the waveforms, the only choice we had now was between MultiWave or standard SineWave. The deletion of the other waveform options was based on owner feedback which suggested that 90% or more used only MultiWave. ClearWave is an option to 'degauss' connected components, for instance between each CD. It can be engaged by hitting a button on the remote at any time but does make funny noises while playing music so we suggest to do it silently. Speaking of funny noises, our PPP was not 100% mechanically quiet. We contacted PS Audio boss Paul McGowan who concluded that it was a one-off issue. Benelux importer Aspera Audio confirmed that our PPP had just come off a plane when he delivered the box. The noise was a little hum from certain capacitors. Guy told us that all PPPs are otherwise inspected for this sort of issue upon arrival in Europe. Another noise came from the grill on top. When the music was gripping -- and with very clean delivery of power, you tend to pump up the volume -- the grill started its own symphony of resonance. You know that zingy sound when you run your fingers across any grill (not the hot BBQ of course). A bit of damping remedied this sufficiently. The convenience of the remote became a big plus. For most music, MultiWave suited our tube-oriented setup very well. A little CleanWave between discs guaranteed that any magnetic influences were killed. We started with daytime listening. In an industrious harbor city like Rotterdam, AC fluctuates from 217 to 235 on a dime. THD unfiltered showed as roughly 4% and the PPP stabilized and purified us at a steady 230 volt with 1.5% THD. At night the incoming figures were only slightly better yet the output from the PPP remained unperturbed and consistent. The display vacillated a little between 230 and 231 volts as a result of rounding off the figure. After some initial fascination with tracking this activity, the display off option became our preference. The PPP does its work quietly in the background and only on occasion is it instructive to see what kind of junk is really coming in from the grid. A steady supply of clean power makes real sense and is very audible. Music playback is more easeful and better balanced. Listening becomes less tiresome as the brain doesn't need to filter or sort through the irrelevant add-ons and haze usually present. The experience of music listening becomes far more relaxed and one is able to absorb more of the musical content for a stronger emotional connection with the material. As with all noise or stress-eliminating actions performed in an audio setup, the image of the performance is enhanced. Minute details are no longer obscured by noise artifacts and the image, whether visual or audible, is less artificial and more fluid. Modern life has its ups and downs. The less pollution you cause, the better. Ditto for suffering less pollution yourself. With the Power Plant Premier, the fight against AC pollution can be won with greater efficiency than before. A nice side benefit is that you find yourself staying at home more often or longer to enjoy the stereo more. At its very reasonable price and with its unequivocal practical merit, we predict the PPP will become a bestseller for PS Audio.